Swords & Stitchery - Old Time Sewing & Table Top Rpg Blog: Dark Genius & Dark War Rising - Actual Pulp Era Campaign Event Nine! Dark Genius & Dark War Rising - Actual Pulp Era Campaign Event Nine! The mystery deepens as the PCs must go room by room in the Turck estate mansion on Long Island as more strange lights are closing in on their position!? But deeper forbidden international secrets were revealed in tonight's game! New factions with alien ties have shown their hand in the game! The action picks up right after last week's game! 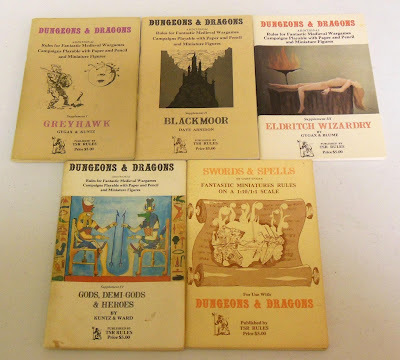 For tonight's adventure I drew partially from the OSR and this lovely lot of original Dungeons & Dragons resources. Especially the Blackmoor & Gods, Demi Gods, & Heroes books for the mythological & old school resources! I'm just getting home now from another successful game of retro pulp Renegade Heroes, Tyrannical Conquerors, & Wasteland Kings which is an OSR mix of Adventurer, Conqueror, King's Barbarian Conquerors of Kanahu, Astonishing Swordsmen & Sorcerers of Hyperborea second edition along with other OSR resources. In tonight's adventure our heroes did a room by room search & destroy of the last of the Little Green Bastards. Hans Q the half-human half-Visitor Nephilim agent will live for now because he's far too valuable of an asset to murder at the moment. 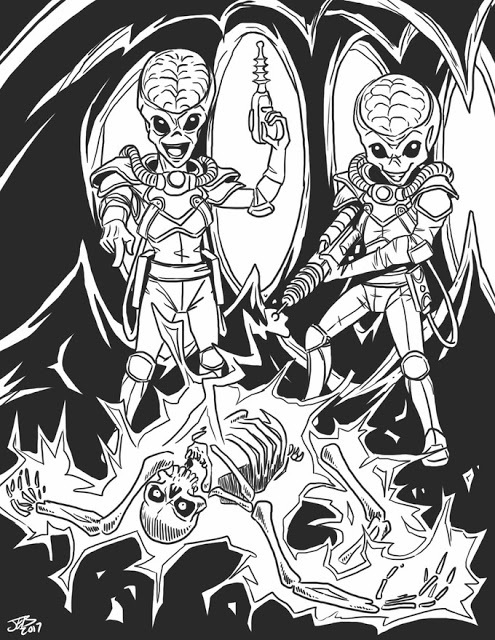 Dark Wizard Games Secret Machines of the Star Spawn adventure was key in designing some of the elements in last night's game adventure! 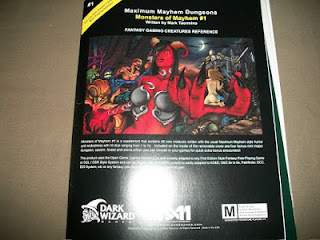 This along with their Monsters of Mayhem #1 has all of the side OSR monsters that I could need or want for the dimensional gate room that was key in tonight's game. Edison's Arkcon Electric industrial laboratory in New York State was key in analyzing the 1898 War of the Worlds war machines. Tonight the PC's discovered stolen plans from the vaults of Arkcon Electric! The truth is that the Edison's Arkcon Electric industrial laboratory in New York State has been compromised by alien forces beyond our world! Now the PC's are on the trail of the Grovers Mill New Jersey wasteland hidden facility. What secrets has Desmond Turck hidden away there? Can the PC's sky ship arrive in time?! Is a strange & dangerous alien robotic guardian await our heroes at the Grovers Mills facility? Why of course it is! But what will happen? Who will live & die in this exciting breath taking adventure? 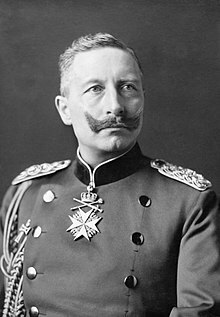 What is the connection of Dark Wizard Games Secret Machines of the Star Spawn adventure? 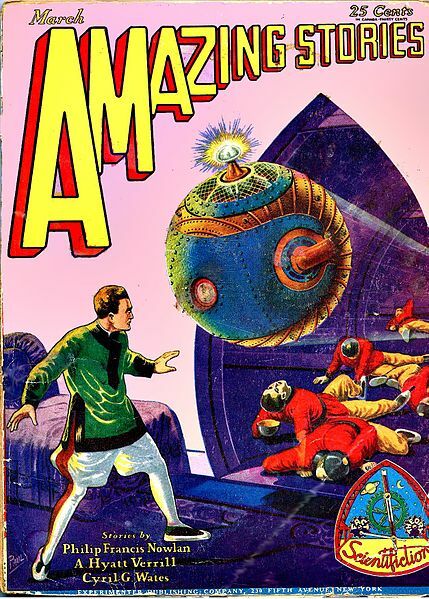 Already the PC's have run afoul of several of the mysterious super science adventures of the dark genius of the alternative Earth version of  Nikola Tesla. Can the PC's survive against the devilry & horror that await them next week in the wastelands of New Jersey? Will there be more dark OSR magick in the wastelands? Can it be long before the legacy of the 1898 Martian Marauder comes to haunt humanity? And what of the looming date of June 22? What does it all mean? Tune in next week for more exciting retro OSR pulp role playing action!